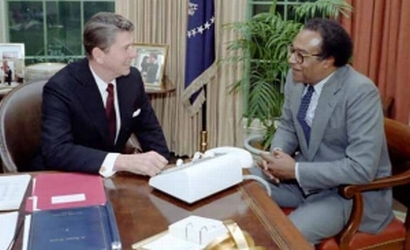 President Ronald Reagan with Samuel R. Pierce, Jr.
Lawyer, judge and businessman Samuel Riley Pierce, Jr., was the first African American partner in a major New York law firm, the first African American member of a Fortune 500 board, and one of the first African Americans to argue a case before the U.S. Supreme Court. His career ended when he was investigated for corruption while serving as the Secretary of Housing and Urban Development (HUD) under President Ronald Reagan. Pierce was born in 1922 in Glen Cove, New York. He received a football scholarship to Cornell University. After serving in World War II, where he was the only black American agent in the U.S. Army’s Criminal Investigation Division of the Mediterranean Theater of Operations, he returned to Cornell and graduated with honors in 1947, then earned a J.D. from Cornell Law School and an LL.M. in taxation from New York University School of Law. Pierce began his career in New York in 1949 first as an assistant district attorney and then as an assistant U.S. Attorney. In 1955, he moved to Washington, D.C. for several public office appointments and later taught law at Yale University and New York University. In 1959 and again 1960, New York Governor Nelson A. Rockefeller appointed Pierce to fill two judgeship vacancies. When Pierce failed in his re-election bids for the seats, he returned to private law practice where he specialized in labor, tax, and antitrust cases. In the early 1960s, Pierce defended several civil rights leaders including Martin Luther King, Jr. He also defended The New York Times in a civil rights case before the Supreme Court. In 1964, he founded the first New York state commercial bank with a majority of African American officers. From 1970 to 1973 he served as counsel for the Treasury Department under President Richard M. Nixon. Despite being quite vocal in his misgivings about the HUD appointment and his desire instead to be named Secretary of Labor, Pierce reluctantly joined President Reagan’s cabinet in 1981. An investigation into corruption in HUD’s low-income housing programs began a number of months after Pierce left office in 1989. It resulted in the indictment of several of his staff members for fraud, bribery and lying to Congress. Pierce died in 2000 at his home in Glen Cove, New York at the age of 78. Jessie Carney Smith, Ed., Notable Black American Men, “Samuel R. Pierce, Jr.,” (Farmington Hills, MI: Gale Research, 1999); Samuel R. Pierce, Fiscal Conservatism: Managing Federal Spending (Washington, D.C.: Heritage Foundation, 1988); Philip Shenon, “Samuel R. Pierce, Jr., Ex-Housing Secretary, Dies at 78,” The New York Times (November 3, 2000; Robert L. Jackson, "Samuel R. Pierce Jr.; Reagan HUD Chief Was Investigated but Never Charged," Los Angeles Times (November 4, 2000). Jessie Carney Smith, Ed., Notable Black American Men, “Samuel R.
Pierce, Jr.,” (Farmington Hills, MI: Gale Research, 1999); Samuel R.
Investigated but Never Charged,” Los Angeles Times (November 4, 2000).